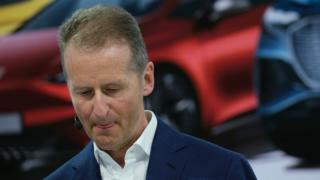 The chief executive of Volkswagen has apologised for evoking a Nazi slogan to describe the importance of boosting the group's profits. Herbert Diess used the line "Ebit macht frei" at a company event on Tuesday. The phrase echoes the maxim "Arbeit Macht Frei" - meaning "work sets you free" - which was famously emblazoned in wrought-iron on the gates of the Auschwitz concentration camp. Ebit is a commonly used acronym for "earnings before interest and taxes". In a statement, Mr Diess said he was sorry for what he described as "definitely an unfortunate choice of words". The German chief executive also acknowledged his company's "special responsibility in connection with the Third Reich". Volkswagen was founded in 1937, as part of Nazi leader Adolf Hitler's vision to enable German families to own their first car. During World War Two, the Wolfsburg-based firm manufactured vehicles for the German army, using more than 15,000 slave labourers from nearby concentration camps. Although popularised by the Nazis, "Arbeit Macht Frei" was coined by the 19th Century linguist, ethnologist and author Lorenz Diefenbach. The inscription appeared at the Dachau concentration camp, set up by Heinrich Himmler in 1933 to use dissidents as slave labour, and later became part of the Nazis' deception for the real use of the concentrations camps. In a separate announcement prior to Mr Diess' remarks, Volkswagen said it would cut 7,000 jobs, as it shifts its focus to electric cars, which require fewer workers to build.